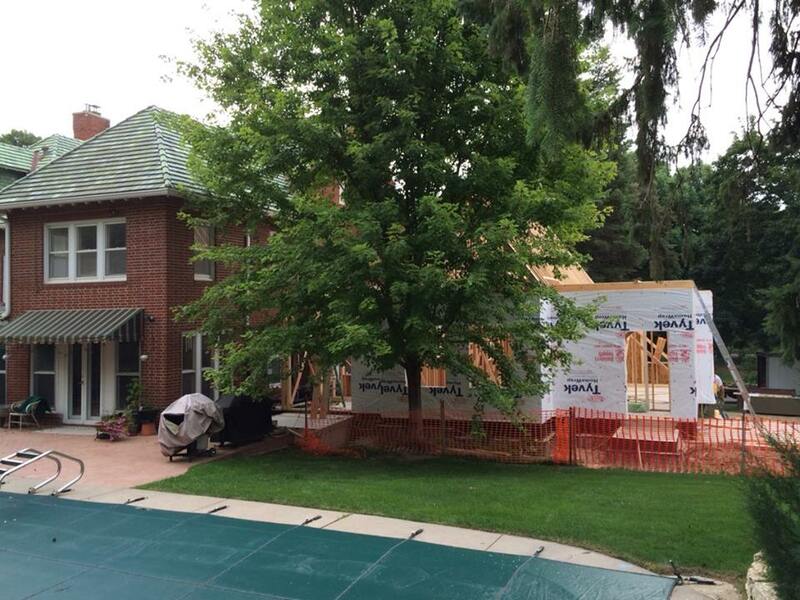 The hole in the maple tree, framed by the window of the addition, August, 2014. But I digress. I remember that date because my dad and I reminisced about his presidency in those days after Christmas and the way he served humbly in that office after the resignation of Nixon and the scandal of Watergate. He was a good man, born in Omaha, a veteran, and just a quiet servant. He and my dad shared that same story. We both wanted to watch the funeral services that were carried on the national media in the days after his death. I also remember those last days of 2006 because of the tree. 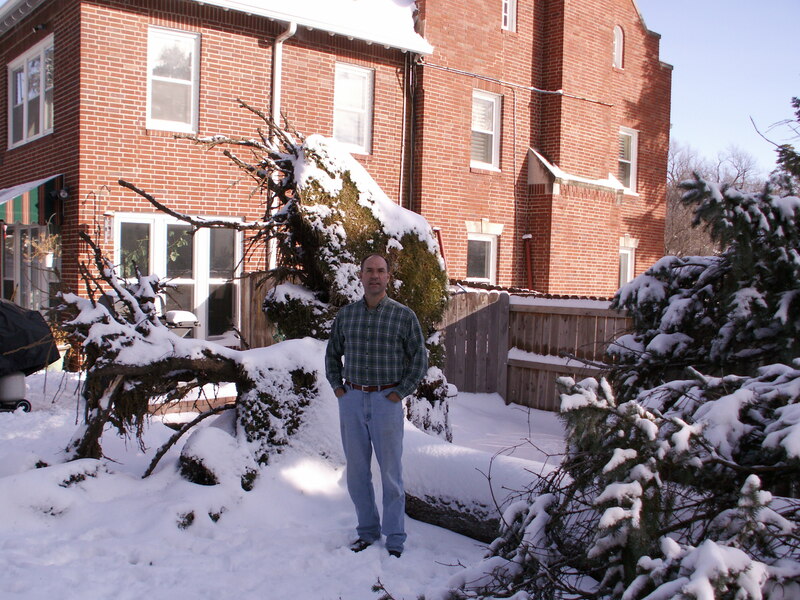 We had a large double- or split-trunk pine tree that grew right outside of our family room on Happy Hollow. It must have been 75 feet tall. It was majestic. It shaded that portion of our patio and house. It used to have a twin right next to it that split in two during a summer storm in 2003, which we had to take down after that. But this magnificent tree stood in that spot until December 31, 2006. Steve standing by the root system of the pine tree, January 1, 2007. It had been a very wet end of the year, mostly rain, and I’m sure the ground was not frozen. Sometime during the night or early morning as the calendar page turned to a new year, there was a large crashing noise outside. Due to the darkness, we couldn’t see a thing so we went back to bed. The rain had turned to snow overnight and in the morning, the pine tree was stretched out its full length to the south. It must have had enough extra weight in its boughs and branches – so many drenched needles! – that gravity just said, “You can’t stand here anymore.” Gravity being a law and all, the tree obeyed. Uprooted. The path of its fall was toward another pine in the corner of the yard, and the two trunks of the large tree lined up on either side of the smaller tree and took off all its branches…and also took out part of the neighbor’s fence. 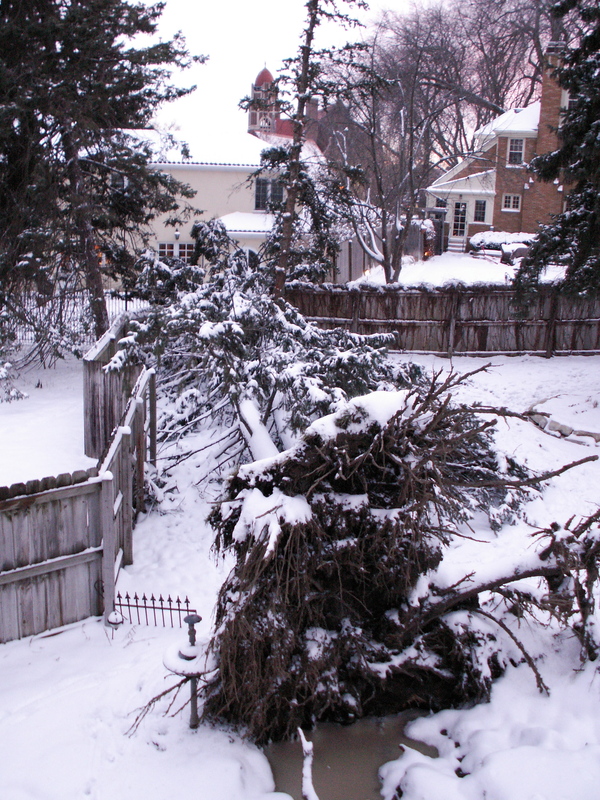 The uprooted pine, the stripped pine and to the left of the tip of the tree, the neighbor’s damaged fence. January 1, 2007. A fence can be fixed, and we did repair it. The trees are another story. I weep at the thought of a tree that large that had probably seen years back to the administration of Warren G. Harding. It had stood through storms that had lashed it and pulled off branches, distributing pine needles and pinecones all around. But that night of continued rain-turned-to snow and small winds had finished it. Jana and I watched Gerald Ford’s funeral services on January 2, 2007, as a local contractor cut up the tree and hauled it away. Such sadness on two counts, I called my dad and we shared our sorrow. On April 23, 2007, my dad George passed away, with six of his children by his side. We sat with him for his final thirty hours on this earth, listening to every breath until there was only one more and then it was done. He passed quietly in the early morning hours. There was no crashing sound like the tree had made. Just no more breathing and he was gone. We had a wonderful memorial service for him three days later and I had the privilege of sharing about his life. I had great notes in front of me, but I improvised the beginning a bit to stop myself from crying too hard. I told a joke we had shared with him over and over during those thirty hours. “Where do you find a turtle with no legs?” And I shared about our mutual respect for Gerald Ford who had died just those three and a half months previously. It was a wonderful farewell for the best dad ever. And then we planted a tree, a maple, in that spot where the pine had stood. In seven short years it has grown into a majestic forty-foot tall giant that provides that same shade to the patio and family room. It seems impossible that it could have grown so big and tall in seven short years, but it has. That’s the maple. 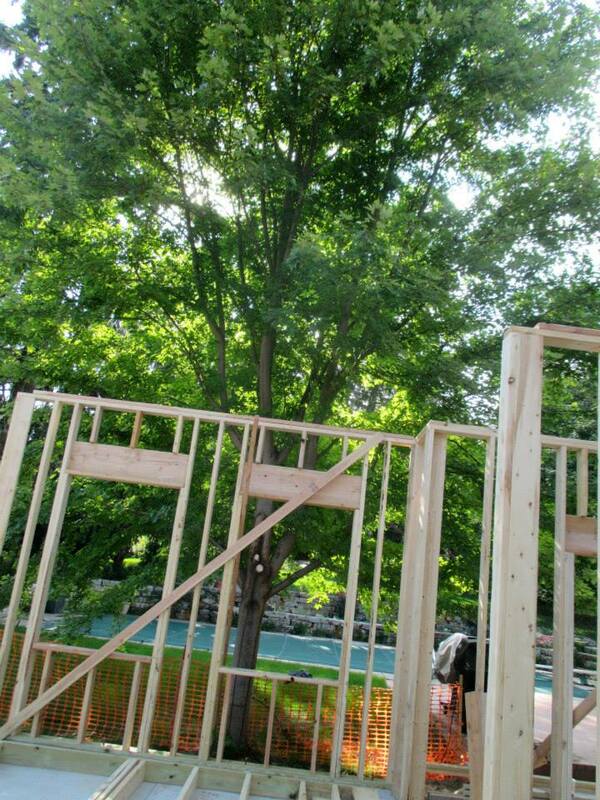 The hole is on the other side and there is not enough room between the tree and the addition. Now, two years later, it seems that we have to take the tree down. It’s too close to an addition we are adding on for Jana. Where that branch came off – even though it appears to be healing itself – there is a hole where insects and rot have started to kill it from the inside. At some point in time, gravity will call it down from the weight of its beautiful, full top. I know I will weep again at such a loss and remember my dad and how we remembered Gerald Ford together. And then I will think, “Where do you find a turtle with no legs?” And I will answer, “Right where you left him.” Tell the joke. FInd the laugh. Memories bring smiles. Life goes on. Storms will continue to rage, literally and metaphorically. And we will plant another tree. You go through life thinking there is no one who thinks like you. 🙂 I use that “voting for Reagan” thing when I am in a game of two truths and a lie. No one ever believes that I voted for him. Gets them every time! agreement. Do you know any solutions to help prevent content from being stolen? I’d certainly appreciate it.